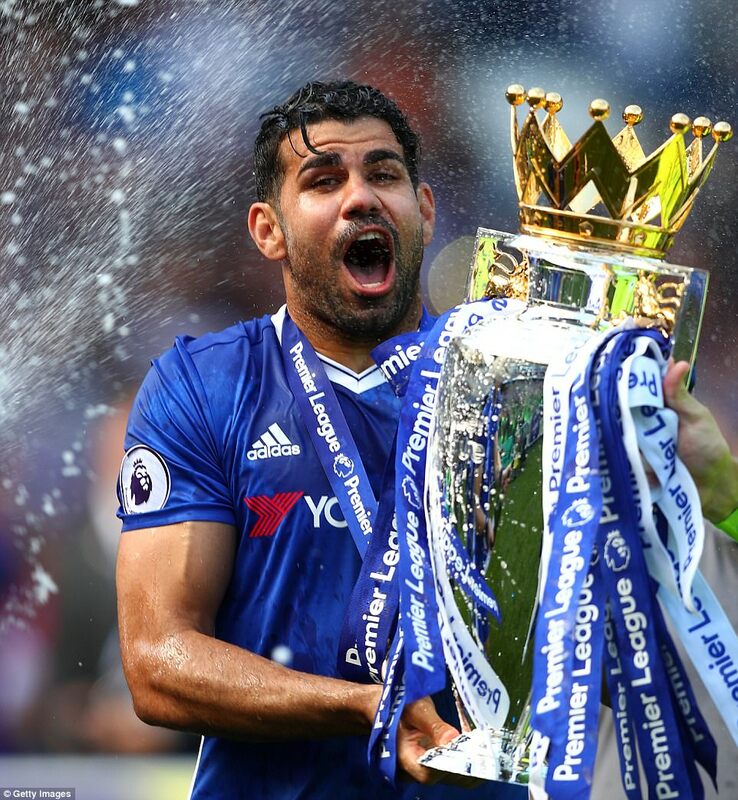 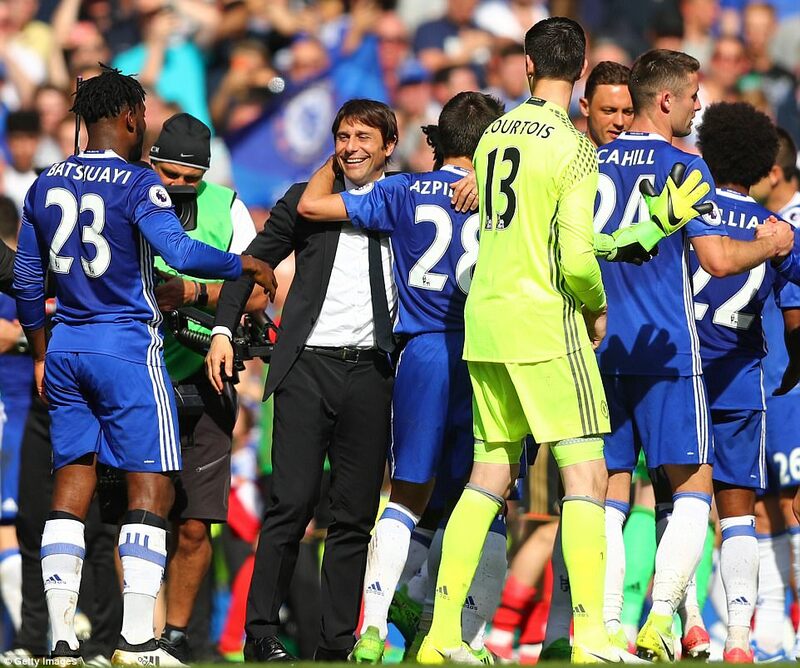 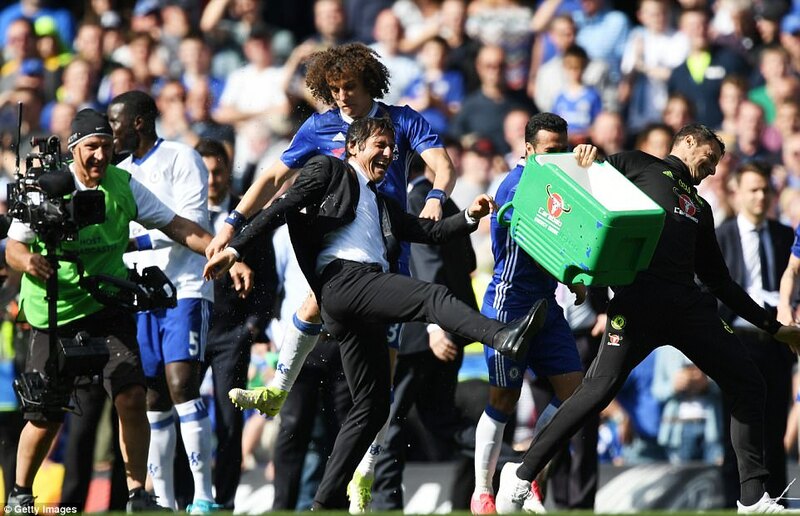 Chelsea roared past Sunderland at Stamford Bridge to kick off their Premier League title celebrations in fine style. 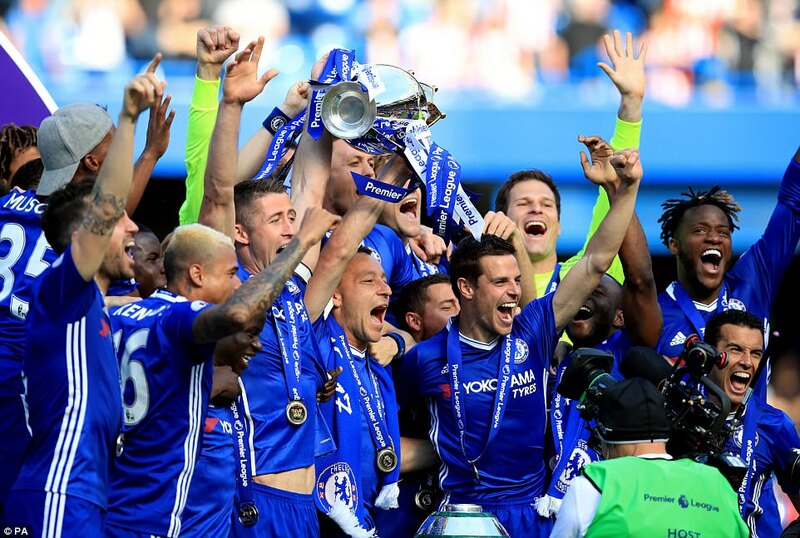 The players, fans, staff, and supporters were in a party mood as the Blues raised aloft the trophy they’ve worked so hard to achieve all season. 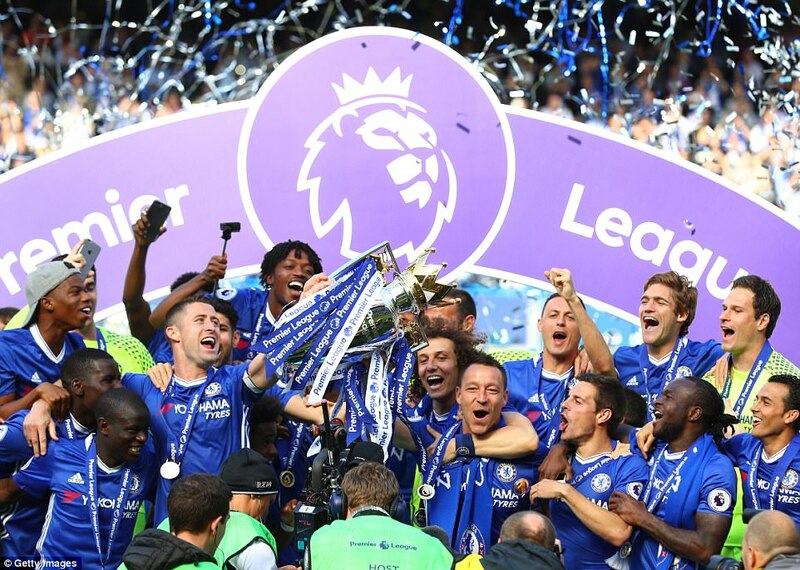 A 5-1 thumping of the Black Cats was a fitting conclusion on the pitch and after the final whistle the celebrations were also worthy of champions. 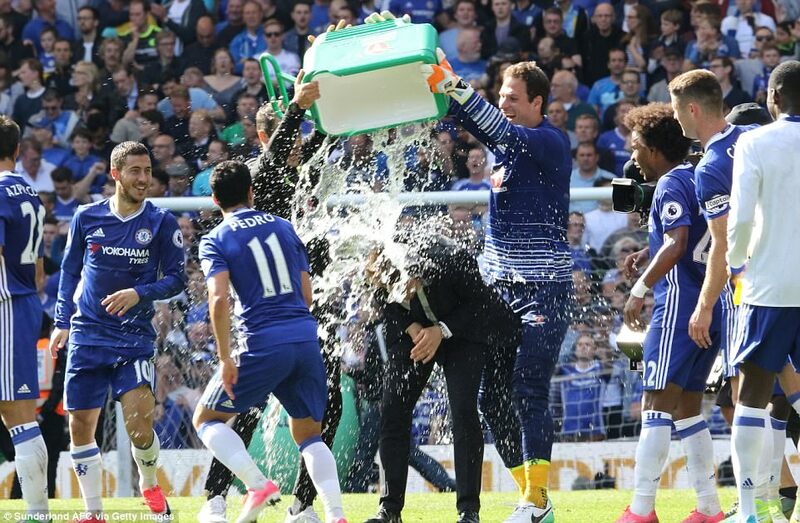 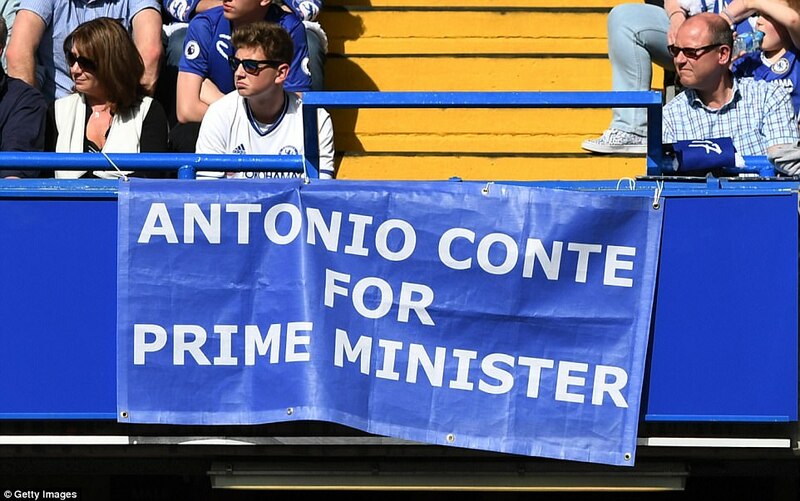 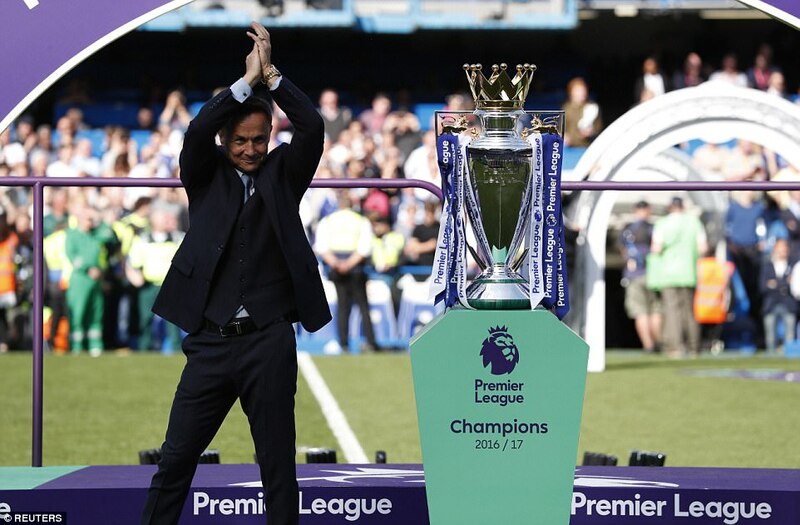 Antonio Conte was dunked by his players at full time and kicked the box of refreshments as the players waited for the trophy to be delivered to the podium on the pitch. 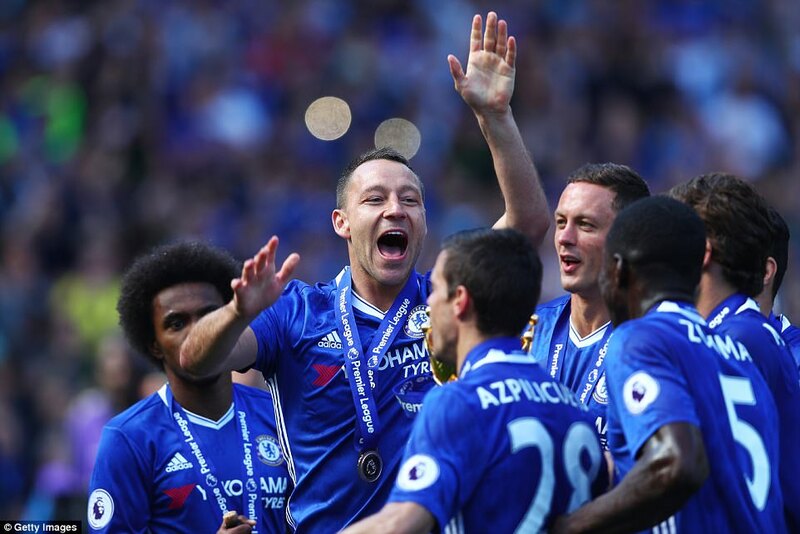 One by one, the support staff and players filed up the steps to take their positions and John Terry lifted the trophy to a booming cheer from the home support who had stayed after the final whistle. 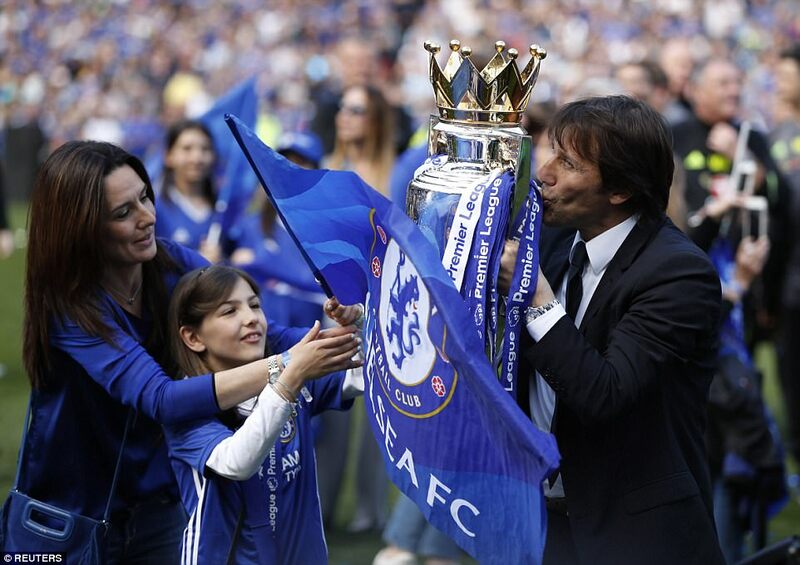 Conte then got his hands on the silverware, planting a kiss on the trophy before taking his turn to salute the supporters who sung his name. 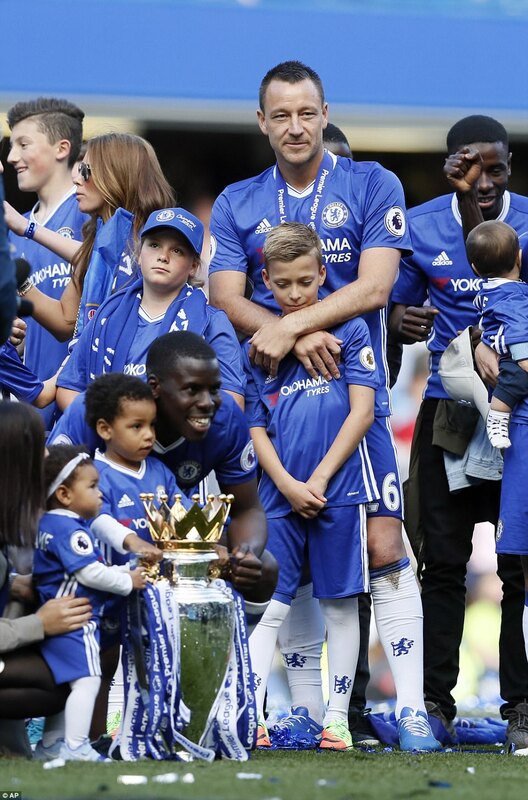 The players were allowed to bring their families onto the pitch and many of the young children enjoyed the celebration with their champion fathers. 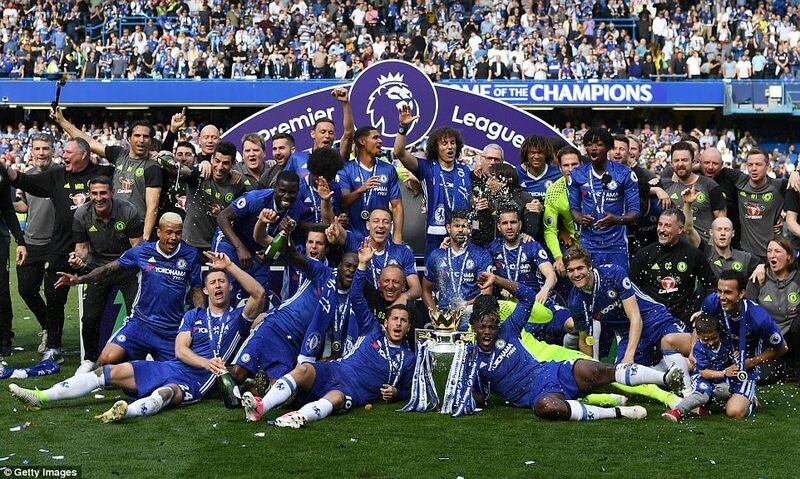 Some opted to record the moment the trophy was lifted on their phones but for the most part the players simply took in the moment. 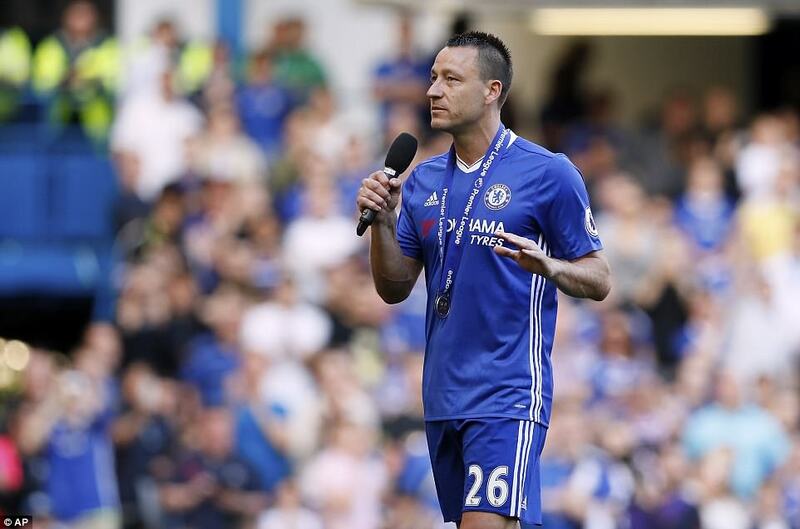 Terry addressed the crowd, thanking them for the support over the years and was tearful in an embrace with his wife after handing the microphone to Conte. 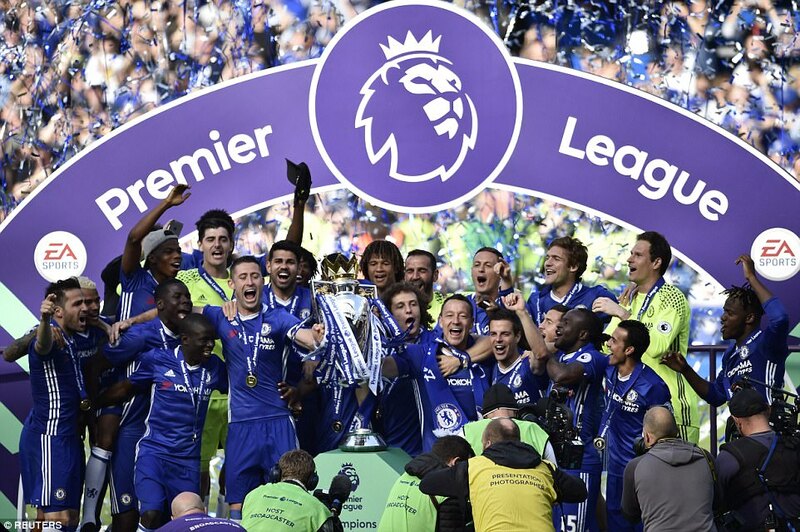 As the curtain was drawn on the season, the champions were crowned with a seven point advantage ahead of second-placed Tottenham. 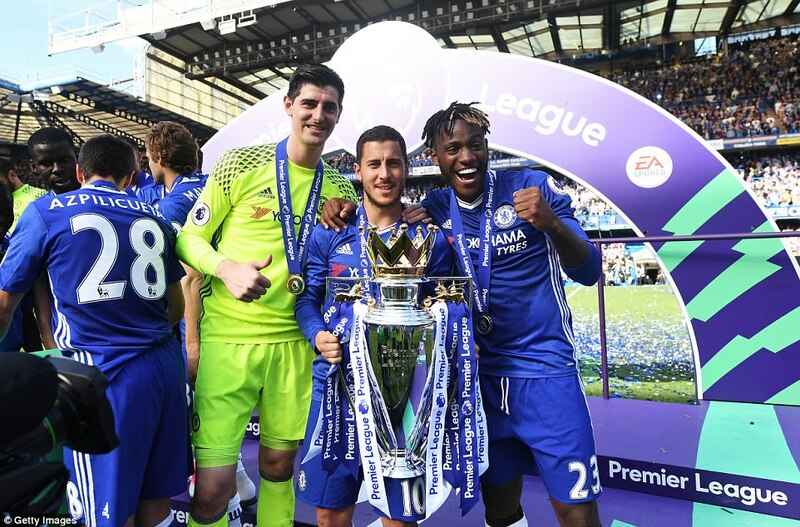 Chelsea claimed 30 victories, losing just five times along the way and will be looking to add more success in the Champions League next season. 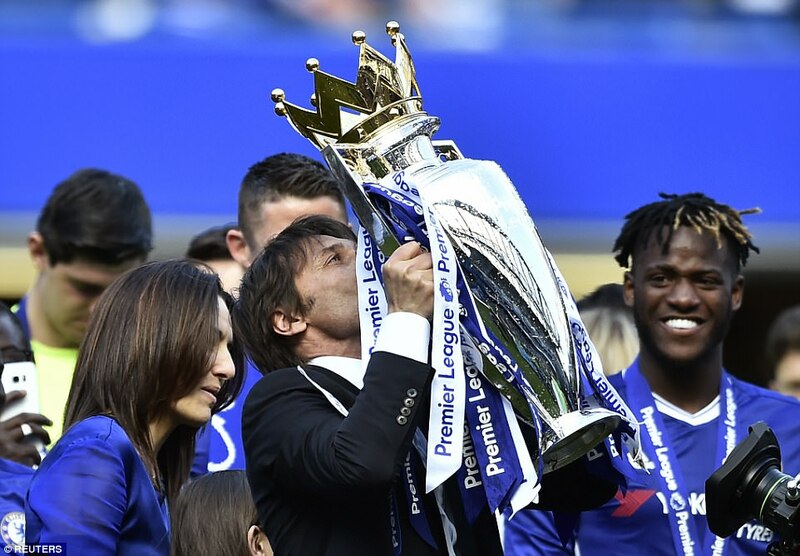 Terry departs as a hero in a fitting farewell and Conte’s men will no doubt enjoy their success before turning their attention to a title-defence next campaign.